Behind this symphony of speed and scheduling is an incredible IT, transportation, and logistics infrastructure supported by over 3,600 men and women at DB Systel GmbH. Managing over 1,250 projects per year, the Frankfurt-based ICT (Information and Communications Technology) provider is an indispensable cog in the DB machine. Their innovative ideas ensure that a corporate enterprise like Deutsche Bahn can remain nimble and future-forward in a competitive transportation landscape. Keeping pace with the demands of modern transport is one thing, but gaining a lead on the competition is an additional challenge that the DB Group is committed to achieving. Part of their strategy is “Code Zukunft” (translation: Code Future), an internal incubator program that aims to discover and develop cutting-edge digital processes that can be scaled across the entire organization. In 2015, project management was a top priority under Code Zukunft. The internal IT team at DB Systel GmbH, which coordinates with all divisions of the company, required a collaborative tool to help manage the volume of varied requests and hundreds of fields of knowledge they work across on a regular basis. In the spirit of discovery that defines Code Zukunft, the team surveyed and presented a selection of programs they used most often in their daily work to accomplish tasks and projects. The goal was to identify a tool that would work well for small teams and wouldn’t require complicated onboarding or training. While a core team of enthusiasts took the initiative to educate and train more team members about boards, lists and cards, the next step was to ensure that Trello would be a fit at scale with DB’s data needs, and to consider the impact of Europe’s latest digital privacy regulations. 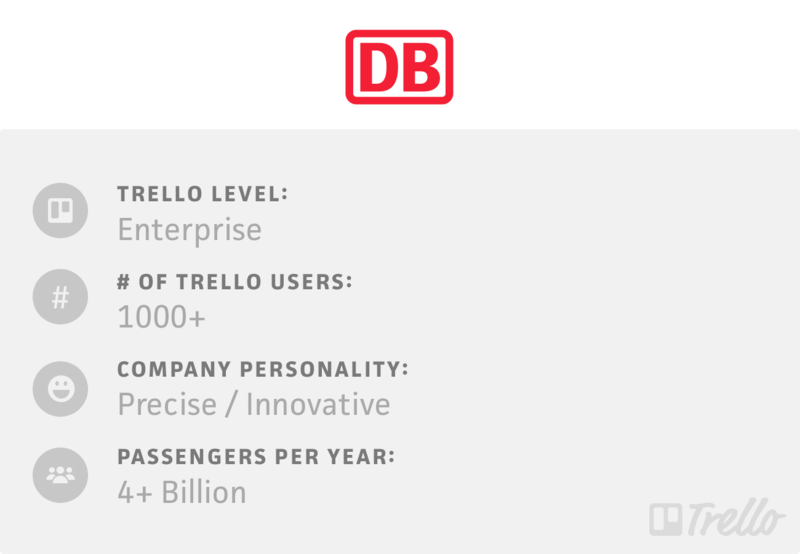 As the first North American digital services company retained by Deutsche Bahn, Trello had the opportunity to collaborate with Deutsche bahn within the new EU-U.S. Privacy Shield Framework, which had been recently implemented in July of 2016. The process of activating Trello Enterprise for over 1,000 DB System employees took about three months, during which teams from both organizations worked together closely. At DB Systel GmbH, Trello is part of a collaboration suite of tools that supports internal agile project management. The ability to organize Trello boards by stages (lists) and tasks (cards) matches perfectly with the Kanban methodology they use to manage projects. Beyond the project workflow itself, DB is receiving positive reactions from employees now that Trello has become part of their daily workflows. The organization is finding that team members are more engaged in projects when they have the right tools. They recognize that, in order to attract top talent, it helps to empower teams with the best available technology to do the best work possible. Even better, they have seen a decrease in complaints about internal IT solutions. Upcoming initiatives include adding Single Sign-On (SSO) and exploring the Trello Power-Ups universe for integrating other tools into team workflows. They credit the successful onboarding and data security process as a gateway towards testing and implementing complementary tools that can continue to boost innovation and employee satisfaction across the entire DB organization.